With NY Party Works, you can bring the excitement of the casino to virtually any location you’re looking to host your event. There’s nothing more exhilarating than gambling amongst friends to see who hits the jackpot, and our expert dealers will assure that even the most inexperienced of your guests will be able to master each table by the end of the night. 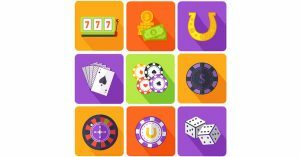 Whether you’re looking for classic games, such as blackjack, roulette, craps, or poker; or it’s a more unique touch you’re after, such as a money cube – NY Party Works has it all. Our experienced staff has hosted various types of casino parties – from fundraisers, corporate parties, holiday parties, birthdays, and Bar/Bat Mitzvahs – you name it! We will help you determine the best layout for your space and suggest the best tables for the nature of your event and the age of your guests. There’s no better addition to the atmosphere of your celebration. Keep your guests entertained while assuring your party is the talk of the town long after it’s over by incorporating a casino theme. NY Party Works will provide the thrills; the only thing you need to do is enjoy your event! Add a special touch with customized Casino bucks! Personalize your casino money or chips, as a great favor to take home for your guests and a lasting memory of the celebration. You can even add a photo of your guests of honor or a company logo. Everyone wins at the end of the day! At the end of your party, everyone can cash in their Casino bucks and get a chance to bring home great prizes. The best part is that you’re not playing with real money – so there’s nothing to lose! We’ll handle every last detail, so you can enjoy your celebration. It can be challenging to get a large group of people together to play a game, but at NY Party Works, we make it easy. We’ll supply the tables, slot machines, chips, money, and dealers and handle set up and break down. The only thing you will need to do, as the host, is invite your guests and have a good time! Take a look at all of the casino rentals offered at NY Party Works, or give us a call today at (800) 469-3866 to begin planning your casino themed event, or to inquire about our other themes and services. Our expert party planners are here to help make your event a success.